Think your child is ready for a booster seat? 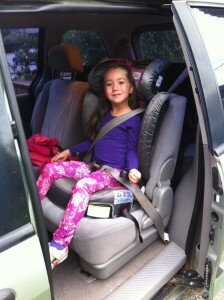 You are here: Home / Life / Think your child is ready for a booster seat? Many parents want to know when their child is ready to ride in a booster seat. In Canada, the law says children can ride in a booster once they reach 40 pounds. Some seats also specify the child must be at least 4 years old, but others don’t, so out in the world, we see many children in boosters as young as 3 or even 2. Why is this a problem, you ask? The seat belt must fit a child properly to be safe and effective. When a very small child is placed in a booster, often times, the shoulder belt is cutting across the neck instead of being centered on the shoulder, and the lap belt is on the belly instead of over the hips. Poor belt placement puts stress on soft tissue and organs, instead of bone. Poor belt placement can also mean the seat belt is not holding the child as well as it should. This could cause serious injuries when force from the seat belt is exerted on soft tissues such as the belly, damaging internal organs that aren’t being protected by bones. In addition to fit issues, many children do not possess the impulse control needed to properly sit in a booster seat for the duration of the car ride until they are around 5 ½ or 6 years old. Unlike in a 5-point harness where the child physically cannot move out of position once buckled, boostered children have a lot more freedom. If children are bending forward to pick up a dropped snack, wrenching their torso around to see a passing firetruck, leaning forward to find a book in the seat pocket in front of them, or reaching across the width of the car to poke a sibling, then the seat belt will not be positioned properly, and it will not provide proper protection if a crash occurs. The risk during a crash is the child’s head striking the interior of the vehicle: windows, seats, or other people’s heads. Some children will fit in their 5-point harness seat until they are 7 or even 8, and leaving them in harnessed seats is a great idea especially if you don’t feel like they can sit properly for the whole ride. Some boostered children will fall asleep and end up leaning out of position either forward or to the side. If this is the case, a 5-point harness is your best bet. However, there are reasons why parents may put children into a booster before they outgrow their harnessed seat. A family may want to pass the harnessed seat down to a younger sibling and move the older child into a booster. Or, perhaps due to frequent carpooling, it may be better to use a booster because other parents may not know how to install your child’s 5-point harness seat. An improperly installed or improperly used harnessed seat is much more dangerous than a properly used booster, provided the child is over 40 pounds and sits properly all the time. There are other reasons why you may want to delay moving your child into a booster. If you have three car seats installed in a row, it may have been difficult to install those seats, but imagine trying to stick your hand in between to buckle a seat belt every day? In most cases, it’s easier for children to buckle themselves into their 5-point harness rather than wedge their hands between seats to buckle the seat belt. Also, if your child is not quite ready for the booster, and still sometimes moves out of position, it can be quite distracting for you as the driver to keep glancing back in the rear view mirror to check. If children outgrow their 5-point harness seat, and aren’t ready for a booster, either because of weight or maturity, there are 5-point harness seats with very high top harness slots available, such as the Britax Frontier and the Evenflo Sureride. So how do you know whether your children are booster-ready? Once your child is consistently over 40 pounds, and at least around 5 ½, you may want to consider booster-training. You know your child best and are the best judge of whether your child is developmentally ready. Take your child booster shopping. Try the booster in your vehicle to insure it fits well, and the seat belt fits well over your child: lapbelt should fit low over the hips or upper thighs, and never over the belly, and the shoulder belt should sit flat in the center of the shoulder, not falling off the shoulder edge, or cutting into the neck. Make sure the shoulder belt retracts back easily if your child moves slightly then moves back. You can start by telling your child that the new seat is for kids who can sit still really nicely in the car, and go over examples of what’s allowed and what’s not allowed while riding in the car. For example, you might tell your child “You can move your arms and legs, but keep your body still so the seat belt always fits properly. If you drop something, you must wait until we stop, and I will get it for you.” You may want to start booster training during short trips where another adult can watch the new booster rider carefully to give feedback or warnings, then gradually try longer rides before putting the child into a booster full-time. We recommend first putting your child into a high back booster. This establishes some physical boundaries, and high backs have head support for a tired or sleeping child. Once children do well in a high back booster for some time, and no longer fall asleep in the car, you can try a no back booster. Remember that if your vehicle doesn’t have headrests at least up to the tips of the child’s ears, you would need a high back booster in that seating position. In this case, check that you purchase a high back that does not require head support behind it. By law in BC, children must be over 40 pounds, and usually also at least 4 years old, to ride in a booster. However, many 4 and even 5 year olds aren’t ready for the freedom, so it’s better to keep them in a 5-point harness until they are ready. Don’t be in a hurry to move them into a booster just because all their friends are riding in one. Most are ready by age 5 ½ or 6. Remember that boosters can *only* be used with lap/shoulder belts, never with lap-only seat belts. Take your child shopping to get a well-fitting and comfortable booster seat. Establish some rules with your child to respect the new found freedom that comes with boostering.